Operation Rescue has concluded an exhaustive survey of abortion clinics in the U.S. and is pleased to announce that it has documented a record number of abortion clinic closures in 2013, during which time 87 surgical abortion clinics halted abortions. The total number of surgical abortion clinics left in the U.S. is now 582. This represents an impressive 12% net decrease in surgical abortion clinics in 2013 alone, and a 73% drop from a high in 1991 of 2,176. 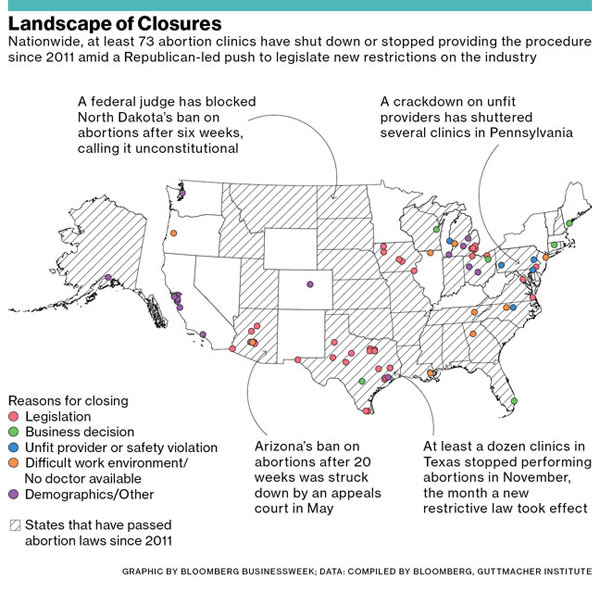 Of 87 clinics that discontinued surgical abortions, 81 are permanently shuttered while 6 abortion businesses ceased surgical abortions, but continued to sell that abortion pill. The figures do not include the 11 abortion clinics that were closed temporarily in 2013, then reopened later in the year. Abortion-pill-only clinic numbers remained relatively steady at 176, with 6 documented closures. “These numbers show that the pro-life movement is gaining ground and that the abortion industry is collapsing – mostly due to its own negligence and greed, which has been exposed by their unwillingness and inability to comply with even the most rudimentary safety standards,” said Troy Newman, president of Operation Rescue. • A decreased demand for abortion reflected in a declining abortion rate. • A flood of new state laws that establish abortion standards. • Increased enforcement of existing laws. • Greater incidents of documenting and reporting of abortion abuses by pro-life activists. • Retirement of aging abortionists, most of which are not being replaced. The state with the most closures was Texas at 11, most of which shut down after Texas passed an abortion law earlier this year that required abortionists to maintain local hospital privileges. New clinic safety rules accounted for closures in Pennsylvania and Maryland as well. • Nova Healthcare Center, Fairfax, VA, closed because of failure to pay back rent that caused Nova’s landlord to terminate their lease amid revelations from pro-life groups that women were being injured and mistreated there. • Associates in OB/GYN Care, Baltimore, MD, closed by the state after repeated dangerous deficiencies, including the death of patient Maria Santiago in February. • New Women All Women, Birmingham, AL, was ordered closed by a judge after pro-life groups documented and reported it for operating illegally in violation of a closure order last year. • Intgrity Family Health, Philadelphia, PA, closed by the state after pro-life groups discovered its illegal affiliation with the notorious abortionist Steven Chase Brigham. Operation Rescue reported earlier how disciplinary action brought by pro-life activists has contributed to the abortion clinic closing trend. Planned Parenthood clinics account for 29.55% of all active surgical abortion clinics (172 of 582) and 93% of all clinics that offer the abortion pill only. Each year, Planned Parenthood is responsible for about a third of all abortions done in the U.S. The survey was a major update to a previous one conducted by Operation Rescue, which resulted in the launching of AbortionDocs.org in January, 2012. That website lists every American surgical and medication abortion clinic along with documents that often show that the clinics have engaged in dangerous practices. Newman said that skeptics often express concern about whether clinic closures represent true pro-life victories. Some people still wrongly believe that when one abortion clinic is closed, another opens to take its place, making the effort to close abortion businesses futile at best. Newman says the latest numbers, carefully documented by Operation Rescue staff, show how effective pro-life efforts to close abortion clinics have been. In fact, even with the opening and/or discovery of six additional clinics, the number of surgical abortion clinics decreased by 81 in 2013. 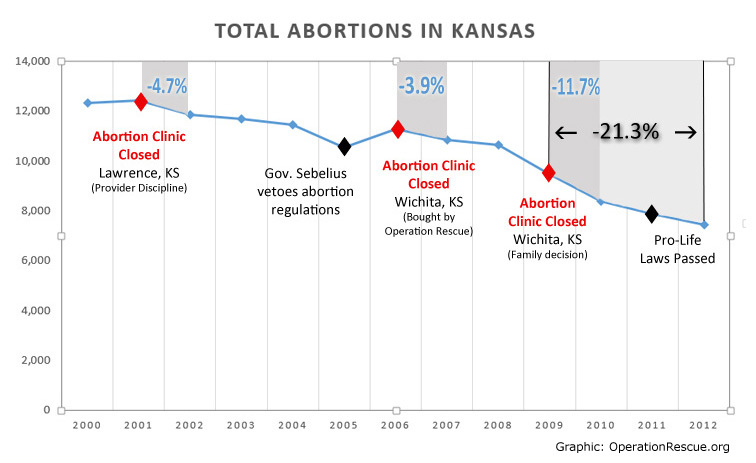 This represents huge gains over 2012, when 24 abortion clinics were known to have closed. The closures have caught the attention of the national media. Bloomberg News published a story on the closures called “The Vanishing Abortion Clinic” (November 27, 2013), based partially on data provided by Operation Rescue prior to the completion of the most recent survey. “At least 73 clinics have closed or stopped performing abortions. New laws are responsible for roughly half of the closures, while declining demand, industry consolidation, and crackdowns on unfit providers have also contributed to the drop,” the article stated. A map (with now outdated numbers) illustrated the closed abortion clinic locations and the reasons for their closures. In November, the Centers for Disease Control released its latest abortion figures that showed a 3% decrease in abortion numbers in 2010. This decrease is in keeping with a 20 year abortion trend. Data obtained by Operation Rescue predicts that when 2011-2013 numbers are in, 2013 will likely see the largest drop in abortion numbers since the 1973 Roe v. Wade Supreme Court decision decriminalized abortion. While national abortion numbers are three years behind, some states have more recent abortion numbers that confirm that additional oversight and watchdog efforts by pro-life groups close abortion clinics and save lives. Even temporary closures are effective at saving lives, the impact of which resonates years into the future. For example, earlier this month, a woman contacted Operation Rescue and indicated that while perusing the OperationRescue.org website, she noticed a May 2007, article about an Englewood, New Jersey, abortion clinic that had been temporarily closed due to gross deficiencies discovered after a botched abortion landed one patient in the hospital. She said that she had been scheduled for an abortion during the time when the abortion clinic was closed. “The abortion clinic called me to reschedule and I never went. I have a beautiful girl that’s 6 years old now!” the woman stated. While the dramatic decrease in the number of abortion clinics is great news, Newman acknowledges that there is still a long way to go. Desperate, the abortion cartel has attempted to push back. From violent protests in Texas to the liberalization of abortion laws in California, it is clear that Big Abortion is attempting to thwart the inevitable. In fact, abortionists greatly fear the emerging trend of abortion clinic closures because they are acutely aware that theirs could be next.